Manny Ramirez had some memorable moments as a member of the Red Sox. 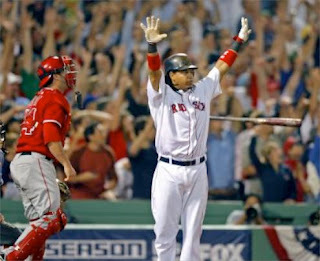 It started right away when he hit a 3 run home run on the very first pitch he saw at Fenway as a member of the Red Sox. And of course, nobody will forget the moment pictured on the left, when he hit a walkoff homerun to give Boston a 2-0 ALDS lead over the Angels, whom they then swept en route to winning the 2007 World Series. But the first time I realized we were watching something special, was on June 3rd, 2001 at the Skydome (as it was then called) in Toronto. Not only did he hit an awe-inspiring blast, but at the time it looked like it might be a key moment in the season. Manny hits a towering home run that was measured at 491 feet, and before the crowd had time to stop ooing, Dante Bichette hit another one to tie the game. The Red Sox ended up winning to complete the sweep, and left Canada with a 2 game lead on New York. Another reason baseball is awesome. No matter the lack of importance of a game or the score, you should always keep watching because you never know when you are going to see something that makes you go "Wow!". Epilogue: The Red Sox lead did not last long and by the end of the month they were chasing the Yankees who ended up running away with the division in what turned out to be a disappointing season.